Our First People's Dog's are known as American Indian Dogs, and not by any other name. Maintaining the True Descendents of the "Old Dogs"
This is the same breed, still called American Indian Dogs that we have all seen described by our First Peoples, from thousands of years ago. 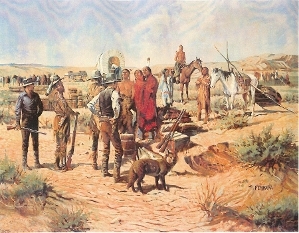 Lewis and Clark wrote about them, extensively, in their travels across the American continent. "The Today Show", 1991,McBeth","Braveheart"(1995),"The Bruce"(1996), the History Channel's show on"Gladiators", National Geographic's "Search for the First Dog"(2003), Animal Planet's"Dogs 101", (2010). American Indian dogs have been featured in "Dog World Magazine" 1981, "Dog Fancy Magazine" 1984, "Dog's Monthly", "Country Magazine", UK's "Dog's Monthly", and "Dogma", "Handbook of Rare Breeds" 1984, as well as countless newspaper articles. PUPS AVAILABLE: We try to keep our American Indian Dog puppies affordable to the right homes, charging only what is necessary to save and maintain the A.I.Dogs as a breed. If you think an American Indian Dog (one of the healthiest dog breeds in the world today) might be a match for your family and lifestyle, call or e-mail Song Dog Kennels. We require phone interviews to get on a waiting list, before we breed a new litter of pups. Our breedings are controlled and limited as our Native American ancestors have done for generations. CAUTION: Within the last few years, since wolf/dogs have become illegal to breed or sell in most states, there have been wolf/dog breeders plagiarizing our many years of research and web site information in an attempt to hide their activites, and circumvent the law. We are not and never have been associated, in any way, with these "so called" breeders now using the name "Native" in front of American Indian to sell what are actually wolf/dog hybrids. 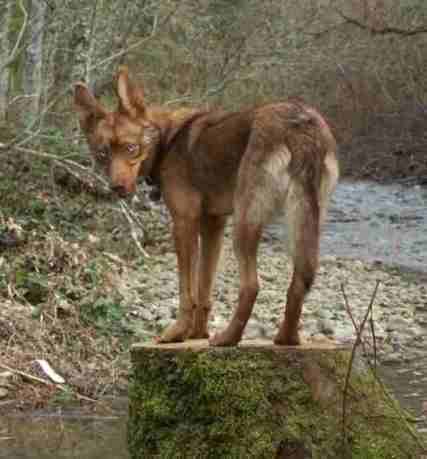 These wolf hybrids are in no way the dogs of our Pre-Columbian, Native American ancestors. Don't be fooled, by people claiming to have "NATIVE American Dogs" please do your research. This site is dedicated to the education and understanding of the naturally balanced "Old Ways", used in the selective breeding of our "Old Dogs"--the dogs we now call "American Indian Dogs". These are techniques originally used by our "First Peoples" ancestors, in the breeding and training of their dogs and horses, from hundreds and thousands of years ago. We want all "First Nations Peoples" to feel proud of their ancestor's abilities to breed their dogs, in a naturally balanced, healthy way, and to understand, how as caretakers, we can honor this inheritance. Through non-political, unprejudiced research and education, we can learn from our Elders and our past, when, where, and why, these dogs were so important to our evolution. We can know what they meant to "The People" then, and what they should mean to us now, and in the future. Many people, including so-called "experts", believe that the old Indian Dogs are extinct. Modern Science agrees with our Elders, however, and has proven that their DNA is even now, within some of our modern breeds, and as pure as they can get, within the selectively bred, American Indian Dogs of our AIDog registry. Unfortunately, many of these past researchers neglected to talk to the actual creators and keepers of these dogs. Amazingly, they never even thought to ask where to find them. They neglected to talk with "The Elders" themselves, to learn just what these dogs looked and acted like. If they had, they would have learned that they are still here, almost extinct, but in small numbers from Alaska to South America. By listening and understanding "The Old Ways" of our Elders, and by practicing this better, more healthy way of selective breeding as Nature would, which includes: no close inbreeding, but keeping those important variables within the gene pool, not creating carbon copies of one or two "conformation champion" show favorite sires and dams for multiple generations, but concentrating instead, on their health and intelligence, as form equals function, which is so important in balanced conformation and personality in canines. Perhaps some of our modern breeds with all the terrible genetic problems they now exhibit, might regain some of their health, and become the functioning breeds they once were, with better education and understanding of "The Old Ways". If the large animal registries would help to educate their breed clubs and individual breeders, valuing healthy selective breeding, over non-functioning show ring conformation, these animals would be much better off and live longer, healthier lives. We hope that by reading this web site from beginning to end, our owners opinions and testamonials, and by talking with owners on our International Indian Dog Owners and Breeders Association (IIDOBA) members forum, that you will begin to understand what an Indian Dog was, and is today, and that you will be able to sort through the mis-information that is out there, and realize how important it is to keep the control of the AIDog breeding out of the wrong hands. Be careful. Do your research. 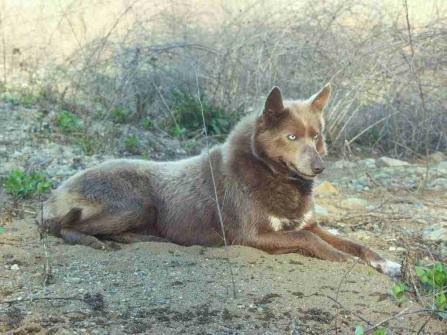 In the last few years there have been wolf / dog hybrid breeders trying to falsely market their wolf dogs as "Native American" dogs. 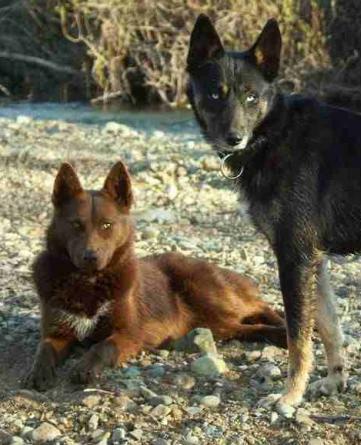 These are not the descendants of our Native American Ancestor's dogs at all. Check with our founder registry for true American Indian Dogs. This was sent to Kim La Flamme from William Pferd III, author of "Dogs of the American Indians". Unfortunately, Mr. Pferd passed away before they were able to collaborate on a book. After his death, Bill's wife sent Kim Bill's entire research collection and three cases of his books, to go toward saving the American Indian Dogs. "I'm so excited to hear that despite my conclusions in my book that the Indian Dogs are extinct, you have been busy saving American Indian Dogs and they are still here after all. It's amazing to me that someone else has done even more research on these dogs than I have, and if I were younger I would be out there, looking for the dogs with you. I'm sending you all of my research material and hope you will consider writing another 2nd edition with the research that my publishers felt to be too controversial. We could include your research and Elder's testimonials, and set all the prejudiced myths and controversies straight--that they are still here and combined into one breed. "In my opinion, the AIDog is the closest canine we have left, today, that shows what the old Dogs were, thousands of years ago. It's very important to Native Peoples to know that wolf hybrids and coyote hybrids are not Indian Dogs, and it is very irresponsible for these hybrid breeders to be marketing their hybrids as the dogs of our Native people." Pat Cummins, Anthropologist specializing in Native American culture, Presedent of the American Indian Rights Alliance, VP of the IIDOBA (AIDog breed club) and AIDog owner, TN. "When I take my AIDog Mesu to visit relatives on the rez., all the Elders that are old enough to remember, know just what he is and remember seeing these dogs when they were young. They say they are not on the rez any longer and are very happy to see they are back. 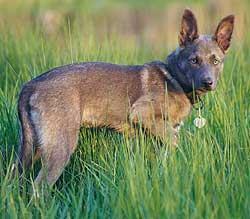 Many have pictures or tin plates that show dogs that look just like my AIDog Mesu, that I got from Kim." "I'd like to thank the hundreds of AIDog owners for taking such good care of their AIDogs, and for keeping them busy with sports or living and working within the family unit, as a responsible member of your family. It does my heart good to know all of my children to GGGGGGrandchildren that I've known and loved all my life, are being enjoyed and taken such good, responsible care of. You have all become expert trainers in your own right." 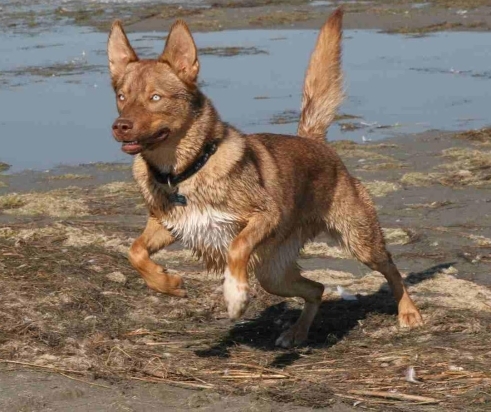 "As important as it is in saving this breed, to actually find as pure bloodlines as possible for each type of dog, knowing what to look for and where to look for them, and selectively breeding them together in a balanced, healthy breeding program, it is just as important that you have responsible owners that understand the training necessary, and who take responsibility for spaying and neutering. 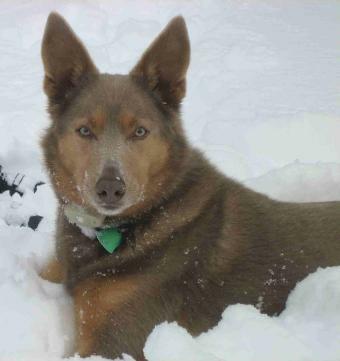 Thanks to the positive word of mouth from the AIDog owners themselves, this breed has been saved, and hopefully, will continue on, without the help of any of the big brother registries and their big promotional, company shows." "Thank you AIDog owners & IIDOBA members and board of directors. It's all of you that are saving these dogs and helping to educate others about them." All content is copyrighted. Use without express permission, is strictly prohibited.